Sunde White Industries|What's My Sister Saill Up To? She's One Eyed Roostering! 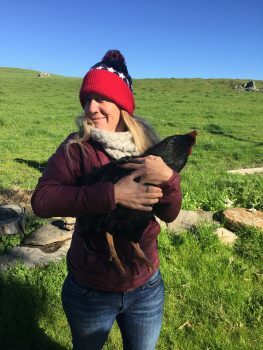 Let’s check in with Saill and see what she’s up to out on her ranch in Petaluma. Since I’ve written about her last there’s been a lot of circle of life stuff happening. Her amazing cat that survived a coyote attack did not survive crossing the road. Saill was devastated and in her grief went immediately to Petaluma Animal Shelter and got a little tiny baby kitten. She immediately regretted the decision and then was like, “Awwwww, he’s so cute! I love him.” Her remaining cat and dog love the new kitten so from rain comes roses. Her beloved old dog Dario also passed away from old age. There is nothing sadder than losing your beloved old dog and even Saill, a hardened chicken rancher by now, can’t avoid that kind of pain. Sigh. Most recently, when I visited her last week, she confessed that she had to eat two of her roosters. “They were delicious!” she admitted. She then went on to describe her wonderful meals, the leftovers and her cooking technique. 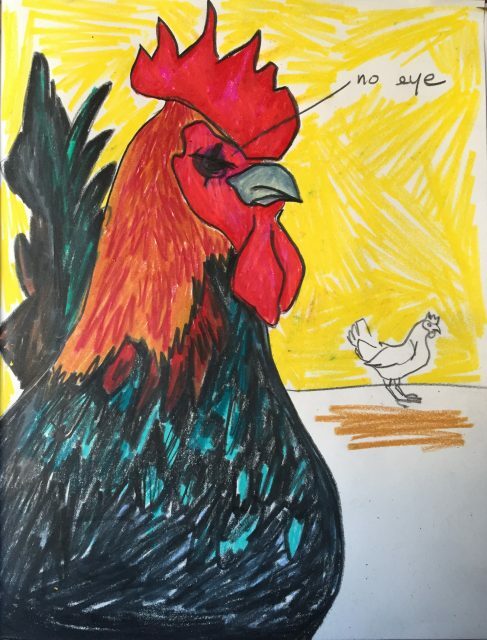 Until last week Saill had been hoping beyond hope that every single chicken farmer that had ever lived was wrong about having more than one rooster. She was sure that, with love, attention and kind words, the roosters could live in harmony together without killing each other. But she was wrong. “They got blood lust.” She whispered. Apparently the roosters started hunting rats and mice at night and once they got a taste for it they couldn’t shake their darkest instincts. “I came out one morning to find a blood bath. They had pecked a rat to death all night and the roosters were going crazy.” Once there were no more rats to kill, they turned on each other. She tried to keep them separated but everything happened too fast. She heard all three of her roosters making noises and by the time she got to them Louie and Vinnie had pecked out Patrick’s eye. “Saill, remember how scared I was of your roosters pecking out my eye when you made me hold him?” Saill has a tradition of making all her visitors get photographed holding a rooster and then she hangs up their photo on her fridge. In my photo I am leaning away from the rooster, not making eye contact. My husband was so scared of losing an eye that he put on my sunglasses for the shoot. “I think you might have been right about that.” She admitted. We walk over to watch the sole survivor. He is huge. His feet are gigantic and dangerous. He turns his head to stare at me with his one eye he has left. There’s a chicken roosting behind him. Saill stands admiring him. “I got ten eggs from the chickens and they’ve all hatched!” She tells me. And so the circle of life continues.